Mission Creek Furniture Group with Fast Free Shipping! The Mission Creek Oak bed features solid wood "Mission Style" construction; reflecting the original designs of the American Arts & Crafts movement. Handcrafted with patience & care - techniques reminiscent of the Mission Era. 1. Northern Red Oak Slower growing cycles create a denser grain for a much harder wood, providing decades of robustness and beauty. 2. Oak Plywood Veneer Prevents swelling, lifting or delaminating for long life. 3. Aromatic Cedar Board Drawers Cedar board to ensure strength & durability and many years of use. Between drawer levels are full dust covers to protect clothing. 4. 24 Ball Bearing Glides Smooth glides for effortless operation. Full extension glides that allow access to the entire drawer. 5. 5-Piece Drawer Construction Traditional English Dovetailing for virtually indestructible durability. 6. Hand Sanded. Timeless beauty and lasting design, with the personal touch of the individual wood working professional to assure final quality. 7. Satin Lacquer Finish Easy to maintain, the exceptionally smooth and highly visible luster adds beauty to any room. 8. Premium Grade Mirror True reflection glass is free from distortion for accurate image projection accompanied with the elegance of beveled glass. 9. Solid Oak Side Corbels Provide visual balance and adds extra support to the tops. 10. Doweled Construction Adds superior strength and stability for years of use. 11. Quartersawn Lumber The grain pattern in this wood is relatively consistent adding increased stability and strength to the end product. Save $100 on these Comfort Craft mattresses! Add a 4500 or 5500 Comfort Craft Soft Side Mattress with your platform bed order and SAVE $100 off our regular price! CC4500 Premium Cotton Fiber Stretch Knit Cover. Choose waveless or semi waveless bladder insert. CC5500 Euro pillowtop design with an Aloe Vera cover. Choose waveless or semi waveless bladder insert. Dual Control (dual bladders) Available in king and queen size mattresses, is two bladders to separate and allow each person individual control of their sleeping environment for the ultimate in comfort. If ordering a DUAL chamber then you will want to add two heaters, one for each of the water chambers. FREE Standard Curbside Delivery (NO LIFTGATE) The shipping company delivers your order to your house but is not responsible for helping you unload or carry it into your house. You must take delivery without the use of the truck's liftgate. Curbside Delivery WITH LIFTGATE The shipping company delivers your order to your house and unloads it curbside with the use of the truck's liftgate, but is not responsible for helping you carry it into your house. Threshold Delivery The shipping company delivers your order to Garage or Carport ONLY. Does NOT deliver inside home. Other delivery options are available. Please call us for pricing 1-800-420-2337. For soft side waterbeds only. 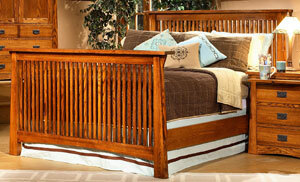 Mission Style oak wood platform bed. Includes: headboard, frame and metal slats. Assembly instructions included. 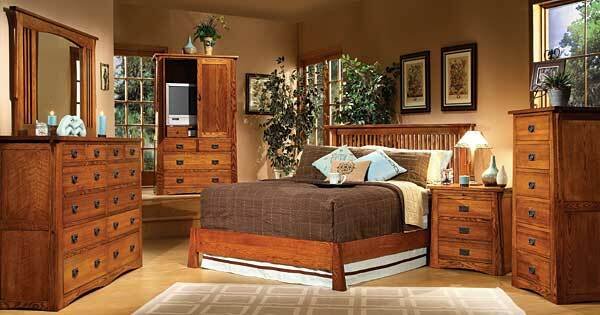 Available with or without optional footboard. Mission Style oak wood construction. Beveled Landscape Mirror Mission Style oak wood construction. With convenient pull out tray. Mission Style oak wood construction.